This week we take some time to share music featuring Waylon Jennings and that’s only the half of it…we’ll also be rolling out new releases like we are wont to do. 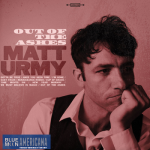 Dave Stroud fills the airwaves with some new tracks from rust belt Americana singer/songwriter Joseph Huber, two new tracks from Matt Urmy, some new Lindi Ortega, and music from the new album “Dead Ringer” from The Whiskey Gentry. That should keep the dust of the shelves, don’t you think?